I'm really on a holo streak, can you tell? Haha. There's just something about spring setting in that makes me happy and gets me in the mood for rainbows. I often get caught by people staring at me when I'm moving my fingers around in a coincidentally sunbeam. They must think I'm pretty deranged. Not that I'm not ;-D.
When we were visiting the China Glaze wholesale last week, I was able to get my mitts on this pretty thing, and for a really small price too. I've always been a bit reluctant when it comes to China Glaze because their formula is really inconsistent, at least that's my experience so far. I absolutely adore their colors, so to be honest I'm really bummed out about this. 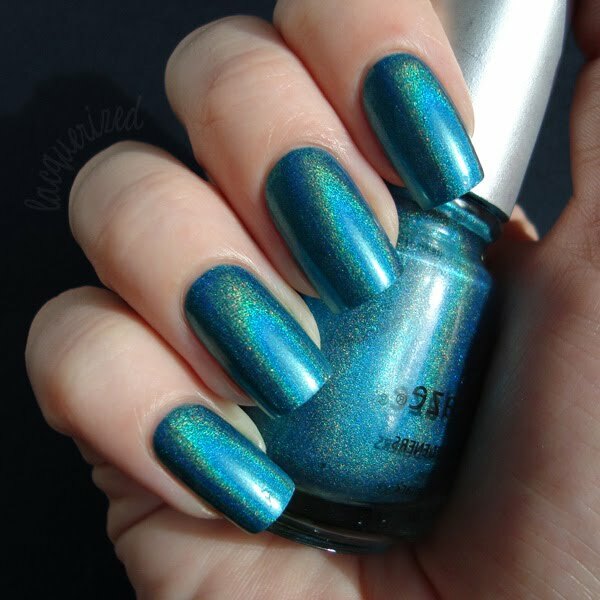 I was really curious to see how and if I'd like this polish! DV8 belongs to the OMG collection, consisting out of 12 dense holographics in a wide color range. I'd already bought LOL a while ago, and as much as I loved the color, I couldn't get over the bad formula. Luckily DV8 really managed to surprise me: opaque in 2 coats, no cuticle drag, everything was just A-OK. The color is really pretty too, a nice medium teal without being bland. What do you think about the OMG collection?